1) Room parents, CNY tickets redeem is this Sunday, 9:30am - 1:30pm. 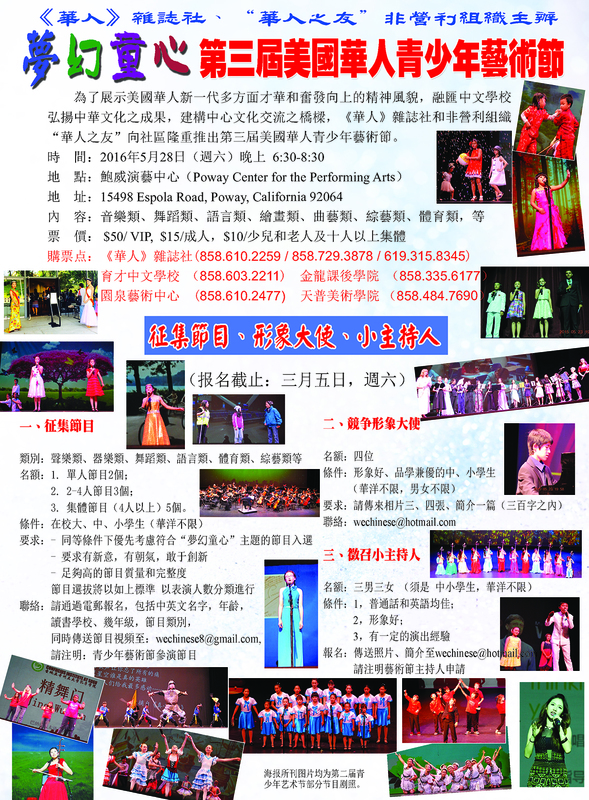 2) <We Chinese American > magazine will host The 3rd American Chinese Youth Festival. March 15 is the deadline to apply for be Image Ambassador and Host/Hostess, as well as auditions for performance. Please refer to the attached flyer. 3) HOC Essay Contest. All students are highly encouraged to participate in this annual contest. Show your Chinese writing skills and get recognized! Application is attached here again. 4) Here are some of the CNY Festival photos for you to enjoy https://goo.gl/photos/3NaLi8iKDrWTjjRJ9 by Zhu Ling Laoshi (AP class). Also attached a photo file is part of the great captures by Mr. Dylan Ren (parent). Have a nice day! and I shall see you all on Sunday!